- JORDANIE : Zuna - During her most recent excavation in Jordan, Laurier archaeology professor Michèle Daviau was astounded by the discovery of a limestone statue and several high-status objects that appear to have been imported from outside the region. The objects were made from a variety of materials: three small black ware vessels, one with an incised design of triangles, two faience cosmetic containers, two faience bottles, one calcite cosmetic vessel, two alabaster vessels, one fine-grain basalt bowl and a steatite cosmetic mortar were discovered in an ancient house dating back to about 600 BC. The objects were in the same room as a 40-centimetres statue of a male with red paint preserved on his left leg and his hands. Such finds have no parallels in Jordan although their source may be Egypt or Phoenicia. The alabaster and faience objects suggest influence from the two superpowers in the region, Egypt and Assyria, but the dynamics whereby these objects arrived at the site are a mystery. They may reflect a period of about 30 or 40 years when Egypt controlled this area. The principal sites under excavation by Daviau in the Wadi ath-Thamad area are Khirbat al-Mudayna and the Roman fortress of Zuna. The former is a walled Iron Age town (1,000 to 600 BC) situated on a hill with the Nabataean/early-Roman period settlement (100 BC to 150 AD) at the hill’s base. More than 150 sites that date from the Lower Paleolithic to the Ottoman period have been located in the dig’s 10- by 11-kilometre survey area. - AZERBAIDJAN : Agstafa -The archaeological digs of the settlements of late bronze and early iron started in Yastytepe settlement. Residuals of brown ware, cutting stones, mud signets, fragments of household utilities and ancient buildings of the late second and early first millennium were found during the digs. The Yastytepe settlement dates to late bronze and early iron. The ancient settlement covers an area of 125 square meters. By holding digs at an area of 50 square meters, the archaeologists traced all cultural layers of the ancient monument. 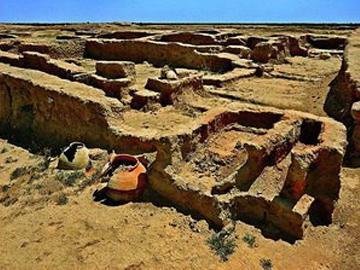 According to research worker of the Institute of Archaeology and Ethnography of the National Academy of Sciences of Azerbaijan Shamil Najafoc, the material and cultural samples mostly consist of fragments of buildings, stone, ceramic, bone and metallic wares. The Yastytepe ceramics is peculiar of the Khojaly-Gedabey culture. Such ancient settlements are often seen in Azerbaijan, especially in Ganja-Gazakh. All materials found in the area will be transferred to the archeological foundation for conduction of radiocarbon analysis and a part has been transferred to the Agstafa historical museum. - CANADA : North Delta - This is the Glenrose Cannery archeological site in North Delta, where since 1969 scientists have dug deep into its earth and discovered artifacts and other remains that confirm that ancient First Nations peoples were using this location as a temporary summer food-gathering place as long as 9,000 years ago. It's certainly one of B.C. 's oldest heritage sites and it's also well known internationally in archeological circles, but as important and priceless as it is, that's still not going to stop the B.C. government from building the $1.2-billion South Fraser Perimeter Road over it. Previous archeological excavations show evidence of human habitation such as stone and bone spear points, knives and other tools, as well as animal remains including elk, deer, harbour seal, shellfish and salmon. The oldest traces have been found more than eight metres below the current surface and represent the Old Cordilleran period, which is between 5,000 and 9,000 years old. However, from an artifact point of view, the site's most productive layers were found between about five and six metres deep, which represents the St. Mungo Period from between 3,500 and 5,000 years ago. The Glenrose site is unique because its deepest parts are much older than similar archeological sites farther downstream on the Fraser. - U.S.A. : Hastings - There is a story in the ground at Spring Lake Park Reserve. It's told through fragments of pottery, chips of stone, arrowheads, bones and variations in the soil. It stretches back thousands of years through centuries of prehistoric settlement. The team first used high-tech equipment to check for varying characteristics of the soil to pinpoint locations that could yield artifacts or ground conditions that indicated a fire pit or a structure. One spot they identified turned out to be a fire pit. Now, a bag of charred rock and burned animal bones is evidence that whoever was there ate large mammals. To the 1950s collection already at the Science Museum, archaeologists added stone flakes -- evidence of tool making -- and projectile points, more commonly known as arrowheads. They also found bits of pottery that, based on its composition, came from sometime between 800 and 1400 A.D. One thing that they didn't find, however, was evidence of permanent housing. - CAMBODGE : Angkor - The five-star hotels around the ancient temples of Angkor are oases of green - sleek new buildings ringed by tropical forests and sprawling lawns. But the water used to keep them so is being sucked from groundwater under the nearby city of Siem Reap, threatening the stability of the centuries-old World Heritage-listed landmark. The widespread, unregulated pumping of groundwater throughout Siem Reap has raised concerns that the temples, including the world's largest religious monument, Angkor Wat, could crack or crumble if too much water is drained away. 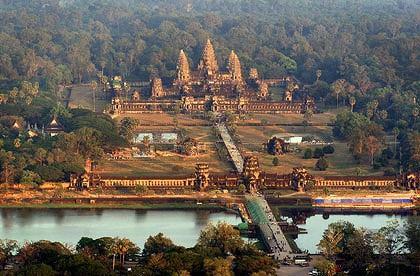 The temples and towers of the 400-square-kilometre Angkor site sit on a base of sand, kept firm by a constant supply of groundwater that rises and falls with the seasons, but which is now being used to supply a burgeoning city. With the number of visitors approaching 2 million a year, increasing pressure is being put on the scarce water resource. Thousands of illegal private pumps have been sunk across the city, pulling millions of litres of water from the ground each day.